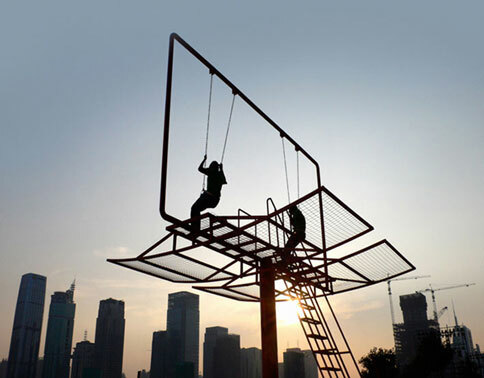 Parisian architect Didier Faustino turned the skeleton of an advertising billboard into a swingset for the Shenzhen-Hong Kong Bi-City Biennial of Urbanism and Architecture. Catchy name. The sculpture, which Faustino calls "urban furniture," is about the reappropriation of public spaces, just like every other art installation since about 2007 or so. Faustino's piece is a much cooler example of this than most, though. And while it looks rickety and unsafe, we all played on worse as kids.